Home | Newsletter 141: Berry Season Has Started and Farmworkers Still Need Your Support! Berry Season Has Started and Farmworkers Still Need Your Support! Over the winter, many of you stood in solidarity with farmworkers at Sakuma Brothers Farm in Washington. Farmworkers there have been asking for better pay, adequate housing, and an abuse-free workplace for years. We asked Driscoll’s to intervene on their behalf. The good news is Driscoll’s responded and has taken these concerns seriously and some good things have happened, including the rehiring of all farmworkers who sought jobs this season. 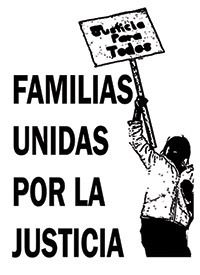 But farmworkers organized as Familias Unidas por la Justicia have started the season without a contract. A contract will address remaining issues, such as a confusing and non-transparent pay scale, and also signal to workers that their voices are important and their jobs are secure. Tell Sakuma Brothers Farm to recognize the independent union on their farm and sit down with leaders to negotiate a contract! 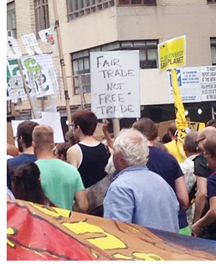 The Fight for Fair Trade Continues! These are just some of the statements released by our allies as it became clear that Fast Track would in the end be approved. The short story is too many members of Congress sided with corporate lobbyists instead of citizens. We heard from so many of you that you called and emailed your Representative and Senators in the last few weeks. Thank you! We almost did it. Although many of us are angry and disheartened at the betrayal of working families, farmers around the world, the environment, basic democratic principles, and the environment represented by this vote, we also know that a more just economy is possible. The fight will continue! Tell President Obama that, especially now that he will have authority to negotiate trade deals, we need to see the text. Tell Wal-Mart We All Want to Live Better! A new report from the Food Chain Workers Alliance (FCWA) exams how well Wal-Mart upholds its own commitments and finds, despite big promises, Wal-Mart’s claims amount to a lot of greenwashing while farmers and workers in the supply chain struggle. Despite a written policy that suppliers must comply with all national and local laws, the report found suppliers in violation of labor and environmental laws. For example, one of its large seafood suppliers was exposed for ties to slave labor. Wal-Mart made a 2005 commitment to 100% renewable energy for all stores. Ten years later its renewable energy in the US stands at just 16%. The report also finds small-scale farmers in the Global South are especially vulnerable to Wal-Mart’s practices and may struggle to keep their farms if Wal-Mart cancels a contract. The report makes a number of recommendations for Wal-Mart to improve its supply chains. Let Wal-Mart know they need to do better for farmers and workers in its supply chain! Recently the Atlantic published an article detailing problems of human trafficking and other labor abuses in Patagonia’s supply chain and the efforts of Patagonia to address them. Patagonia is addressing its own supply chain by increased auditing throughout the supply chain and by asking more of its suppliers to address the worst abuses, for example employment standards addressing human trafficking. Left out of this article, however, is the troubling relationship of Patagonia with Fair Trade USA (FTUSA). FTUSA in recent years has developed an apparel program that looks only at the final cut and sew factories before rewarding a “fair trade” label to brands, even though some of the worst abuses, including those that turned up in Patagonia’s own audit reports, are buried deep within the supply chain. From the blog: social justice activists speak out against corporate takeover of Milan World Expo. 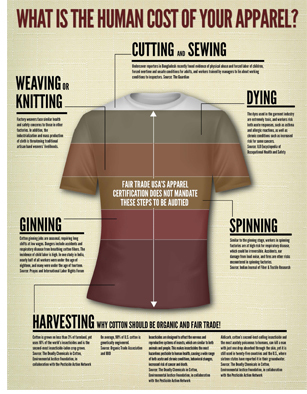 Fair trade evolves and returns to its roots: the story of the Small Producer Symbol. Coffee farmers are feeling climate change and the fair trade movement is seeking to keep farmers needs at forefront of discussion. Walmart steps us its greenwashing. Senator Wyden recognizes hemp history week and calls for end on growing ban. Will TPP be used to keep slave labor in the chocolate industry? Mark Bittman speaks out on paying food workers fairly.